Ducted air conditioning is a very popular method for cooling and heating home all across Australia for a variety of reasons. Many people enjoy the minimalist design that easily serves a larger or more complex home layout. Some modern models also have inverter technology that can significantly reduce the amount of energy consumed. Let’s examine four benefits that can be enjoyed by installing a ducted air conditioning system. As the name would suggest, a ducted air conditioning system uses a series of ducts to distribute the treated air throughout the home. This form of air conditioning is well suited to cover multi storey or larger homes. The ductwork can be run anywhere in the home; it’s installed behind the wall and in the roof spaces to keep everything neat and tidy. This type of system blends effortlessly into the design with no odd structures to accommodate. The vast majority of the modern ducted air conditioning system are reverse cycle units. This means that the system can be used for cooling and when required it can be reversed for heating. This is ideal for keeping your home comfort levels manageable throughout the year. It also negates the need to install separate cooling and heating systems saving time and money. Using a system like this with a smart thermostat can make it even more economical and easy to use. Installing ducted air conditioning is very simple if you’re building a brand new home. The installer can run the ductwork during the construction phase and add the actual equipment later. However, once the ducts are in place, it’s very difficult to change the layout later so make sure that you’re happy with the placement before building continues. There should be no strange twists or kinks in the ducts that will slow or impede the airflow. If the ducts are going to be installed in an existing home, it can be more complicated, but the process is still simple in execution. In the past, a ducted air conditioner would have consumed more power than a split system alternative. Some modern ducted systems now use inverter technology to scale the power according to the demand. This makes these systems very energy efficient for the average user that uses the system for an hour or two each day. 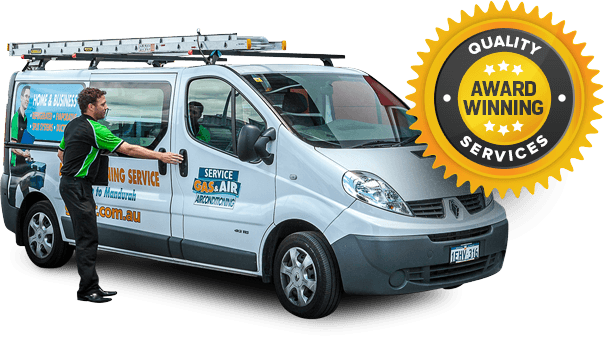 If you’re interested in a new air conditioning system, contact us here at Gas&Air. We install, supply and service a wide selection of heating and cooling equipment, including ducted evaporative air conditioning systems. We pride ourselves on the high quality of our service and offer easy financing for qualifying customers. Our team is ready and standing by to discuss your needs in greater detail and to answer any other questions that you may have.